When the food supplies are depleted, survivalist seeds will give people the power of planting. ...The global economic downturn and skyrocketing food prices have forced millions of people into hunger and poverty. According to a recent article from Absolute Rights, the current state of the global food supply has people turning to survivalist seeds to ensure their well-being should the supplies become depleted because of climate change, international conflict, or natural disasters. Stopping their dependence on consumerism for their nutritional needs, these folks are preparing themselves for any situation. The article stated that with the help of Absolute Rights and their new Special Report “Seeds for Life: Preservation, Extraction, Storage, and Trade of Seeds,” anyone can do the same. The report is a simple, time-tested system of growing your own food supply, and covers everything from acquiring organic seeds to harvesting multiple crops on a consistent basis. It’s not just an instruction list that says “Dig hole, bury seeds, water, and wait,” claimed the article. It’s a comprehensive plan that provides information on storing and caring for seeds until they are needed to ensure maximum output. It’s a guide to choosing from the multitude of seed offerings and finding ones that grow well in a specific area. Plus, it presents a method of bartering, trading, and selling excess seeds, whether there’s a crisis situation or the prices explode, the article said. Global food prices continue to rise, inspiring the United Nation’s Food and Agriculture Organization (FAO) to establish its Initiative on Soaring Food Prices. They claim that the global economic downturn and skyrocketing food prices have forced millions of people into hunger and poverty. Though the majority of people affected thus far from food price hikes are from poor, developing countries, it’s an indication of where the world is headed if changes aren’t made, the article stated. The report goes into detail on the procurement, planting technique, cultivation, and safe storage of seeds, giving people the fullest and most comprehensive understanding of the process available anywhere. The report is not just a procedural guide to planting seeds as a fun hobby. It’s a guide to using seeds for survival. Absolute Rights is an organization meant to provide actionable advice and impactful insight into geopolitical and domestic issues. 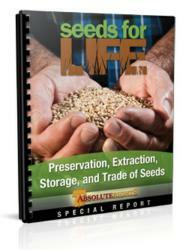 The “Seeds for Life” report, including information on how to get 20 to 30 pounds of free organic survivalist seeds for use immediately, is available at http://www.seedsforlife.com/read/.